I’ve always had a bit of a fascination with technology incorporated into watches. I remember when I was about six years old Woolworths having a Zeon watch with a radio incorporated into it. It looked pretty tacky, particularly as the headphones were connected all the time, but I was fascinated at the prospect of listening to the radio on a watch. Then of course the calculator watches came along – I guess anybody who needed a calculator on the go also had midget fingers as the buttons were ever so small. As I’ve gotten older, I’ve realised that watches are more of a fashion statement rather than technology. I guess this has helped me (and my wallet) avoid buying many of the ‘smart’ watches that have come along in the past couple of years. Sadly that hasn’t happened in the area of Bluetooth headsets, though with the latest Bose one I finally have found something that I can use reasonably often (although just at weekends when calling friends). Anyways, over the past 10 years or so I’ve only owned 2 watches, with the second only purchased as I can’t survive without a watch with the primary one goes in for servicing (£470 for the privilege of being without your watch for 10 weeks, only Europeans could come up with a service model with those variables). I happened to be in Korea when the Samsung smart watch was released. I did think about buying one, even though I don’t actually own any Samsung products as I think their aesthetics aren’t great, but actually couldn’t find one in a store to look at. When I finally had a look my suspicions were confirmed – it didn’t look that great. I do wonder why large companies don’t realise the value of a watch as a fashion statement and partner with one of the big watch companies like Swatch. 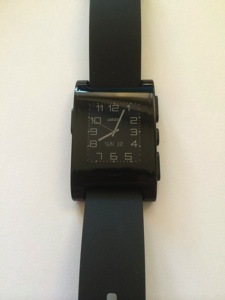 A few weeks ago I was at Best Buy and noticed they had Pebble watches in stock. After some research (albeit with an awful website) I took the plunge and bought one. After much debate in my mind, I decided to buy the black one (figuring it looked a bit like a black Rado from distance so not so tacky). Incidentally it was the first purchase I had ever made at that store (kind of strange since you’d think as a tech person I’d find things to buy there !). The watch was set up that night, but then put back in the box (like Bluetooth headsets) as I was travelling back to Europe. I had been meaning to play around with it more, but never had the time until this weekend. Prompted by an article about new software, I decided to wear it on any outing to the City to try it out. So what’s the main benefit ? Well, the main advantage is control/status of the iPhone without the need to have it in your hand. After a short period of time, you realise how useful this is when you are walking around in the city. I can advance music tracks without having to pull the phone out of my pocket. The phone vibrates when a text message comes in, and displays the text on the watch. I also didn’t miss any calls as the phone again vibrates when a call comes in (and shows you who is calling). Overall, a good purchase, albeit let down by a lousy website. A bit more work on that could yield a really useful consumer product. I predict that next year someone will actually come up with a useful product next year !